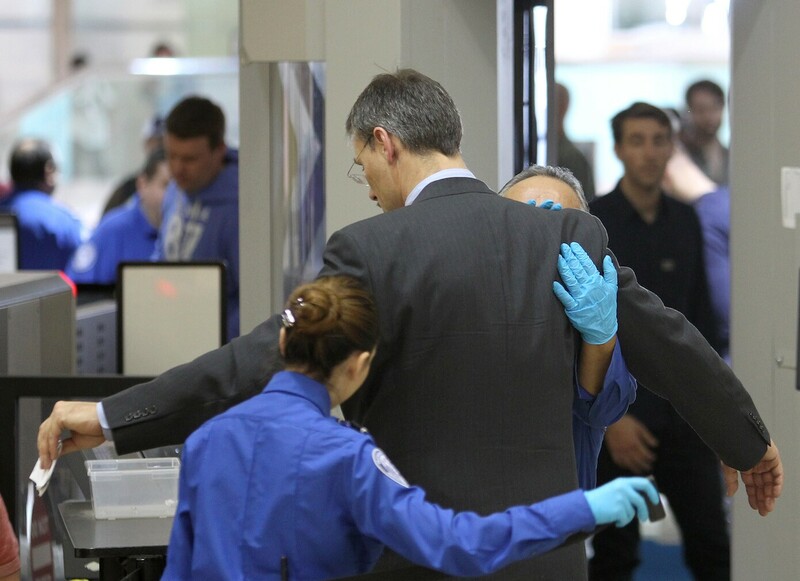 An air traveler is patted down after passing through a full-body scanner at Los Angeles International Airport (LAX) on February 20, 2014 in Los Angeles, California. THE WEEKLY STANDARD’s John McCormack wrote last September about his interaction with the TSA’s new “enhanced” pat-down procedure, wherein an agent “runs his hand inside a passenger’s waistband and also runs his hand up the back of each leg until he ‘meets resistance’ and then does the same from the front of each leg.” John (who is among the most genial people humankind is capable of producing) was randomly selected for his inspection. I, on a recent trip from Jackson-Hartsfield International, was not. The advanced imaging technology (AIT) scanner at the security checkpoint detected something amiss on my person. As ProPublica reported in 2011, “Any potential threat is indicated by a yellow box that shows up roughly where the software detected it—on the right ankle, for example, or the left elbow.” For me, it was my back. It follows that isolating such an area would allow travelers to forgo the unpleasant experience of being felt up indiscriminately—or, as John wrote, “right over the zipper area of one’s Gap Outlet comfort-stretch khakis.” If the imaging produces a yellow box only over the back, and an agent explains it as such, then clearly the back is the place of concern. The person already has held the mid-jumping-jack pose inside the fancy photo booth and had all other bodily areas, including the left ankle, the head-shoulders-knees-and-toes, and the crotch, cleared for takeoff. Just the same as John and doubtless thousands of other individuals, a professional, shall we say thorough TSA inspector explained to me how he was going to run his hands inside my waistband (which, the imaging resulting in what it did, is arguably passable)—but also run them up and down my legs, in a manner of unwelcome and quite awful foreplay. As part of the sheeple, I allowed the employee to proceed without objection, as well as swab my fingers, and continued on my way after being green-lit several moments thereafter. There are two interrelated takeaways from this. First, the TSA must be skeptical of its technology if an agent reserves the right to pet an area of the body that already was cleared by a scanner. Second: In that case, what’s the point of using a scanner in the first place?